More compact design at only 12-1/2 long and weighs only 5.6 lbs. Ergonomic shape fits like a glove with even pressure and easy control. LXT Lithium-Ion provides longer run time, 5x lower self-discharge (for use any time) and 16 firm holding contact terminals (for constant high power). A Built-in electronic control circuit with L. Warning lights for overload protection. 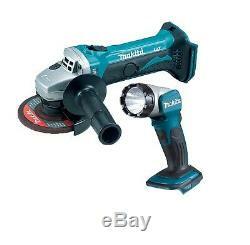 Powerful angle grinder now free from the restriction of cables and power sockets. Capable of using wheels or discs for mains grinders. Easy-to-grip, small circumference motor housing with an anti-restart function and an electronic current limiter. Grinding Wheel: 4-1/2" / 115mm Cut-Off Wheel: 4-1/2" Wire Cup Brush: 3-1/2" / 115mm Sanding Disc: 4-1/2" / 115mm No Load RPM: 10,000 Watt Hours: 54.0 Battery: 18VDC (3.0Ah) Spindle Thread: 5/8" - 11 UNC Overall Length: 12-1/2". Ability to tilt in nine different positions which means no matter where you need the light to point the lamp wont let you down. Can be powered by either 14.4v or 18v li-ion batteries from Makita. Operating time max: 13/9 h. Battery: 18 V / 14.4 V. Dimensions: (L x W x H) 256 x 79 x 99. Operating time (hours): 13-3.0Ah, 1.3Ah 6-(18V) / 9-3.0Ah, 1.3Ah 4 (14.4V). Please Note: This listing is for the BODY ONLY of both items - No Batteries - No Case - No Charger. The carrier will attempt 2 deliveries. Items less than 2kg are sent via 1. In this instance a redelivery charge will apply. Please note we do not make deliveries to PO Boxes. Our carrier aims to deliver within 24 48 hours within the UK. Our European deliveries depend on the location and can take between 2 5 days from the point of despatch to be delivered depending on the town and country. All machines are UK models and are CE marked. We are a family owned business supplying hand and power tools since 1983. Our reputation has been built on distributing products at a fair price backed up by an after sales service second to none. Our specialty is in separating manufacturers multi kits, creating our own and offering the items at preferential rates. Our carrier aims to deliver within 24 - 48 hours within the UK. Our European deliveries depend on the location and can take between 2 - 5 days from the point of despatch to be delivered depending on the town and country. Items no longer wanted, it is your responsibility to post the item back to us, in new, unused and resalable condition. Incorrect item Received We have strict control and checking procedures operating in our warehouse so it is extremely unlikely that an error will occur. However, sometime mistakes can still be made. If this happens we will collect and redeliver a replacement item as soon as possible and this will obviously be at no cost to you. Received Damaged Item Please try and check the condition of the parcels before you sign for them, if you are in any doubt please make a note on the couriers paperwork. Sign up to our Newsletter. Get all the latest News, Updates and Special Offers about our Shop. The item "Makita DGA452 18v Cordless Angle Grinder 115mm Lithium-Ion + DML802 Torch" is in sale since Monday, April 1, 2019. This item is in the category "Business, Office & Industrial\Power Tools\Grinders\Grinders".2007" and is located in London. This item can be shipped worldwide.